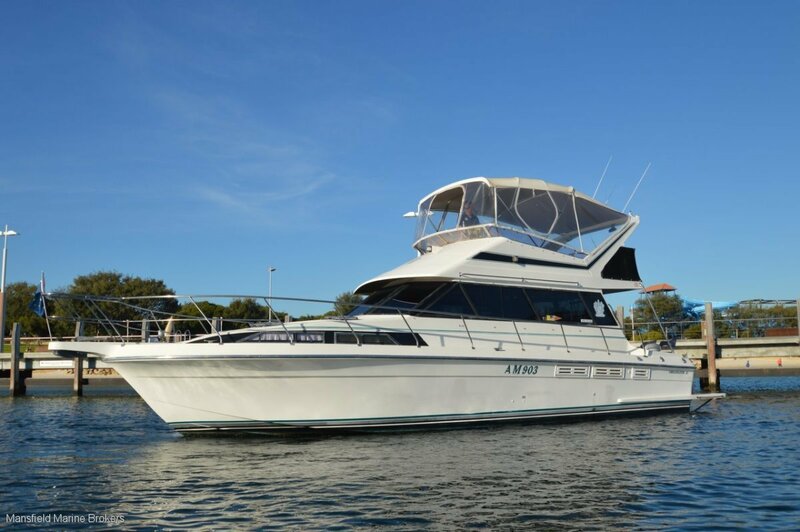 This Princess Dereemer/Ambassador 42ft Flybridge sports cruiser with targa top was designed/built in NZ in 94 with extensive features including large saloon & flybridge social areas, 2 nice cabins, large refrigeration and many more options. Also COMES WITH HILLARYS PEN (terms & cond apply) Call one of our team today! While carrying a nice profile she is also a great ocean going cruiser. Extended swim platform with utility rail, mounted BBQ and bait board and of course 2 x shaft drive diesels for performance and reliability. One of the first things you notice when you step aboard this boat is the very well designed saloon, with aft galley and nice flow throughout the boat. Nice light timber finishes and the many little things that make this boat a great package. All new clears and canvas installed in July 2016 ( $8k) and just serviced, antifouled, polished and prop speeded. The owner has moved to a larger boat after loving this family beachouse for many years and has certainly been keeping the love and maintenance up to her. This boat is in our Premium dispaly pens at Hillarys Marina. These 4 stroke 310HP 500 ( 8.5 ltr) series diesels and in beautiful condition and power this good performing hull very well. The good sized galley with again great views all round is placed aft to make for great entertaining. Big refrigeration with separate freezer, microwave and cooktop will keep the cook happy! The two forward cabins and convertible lounge in saloon make for 7+ berths. The very large air-conditioned saloon wih views all round leads nicely onto the back deck, big swim platform with BBQ rail. Chart plotter, GPS. VHF, 27MHZ, stereo and flat screen tv to saloon. Good looking ocean going boat with a lot to offer, great for the family, twin station controls, dinghy and outboard, and ready to go!